No two patients are the same, scan quality varies, new scan modalities arise, and so do their file formats. Yet, if the end goal is quality patient care, you want to ensure that your virtual 3D model accurately represents the patient’s anatomy, and you want it fast and easy. The result is an advanced and robust segmentation toolbox for patient specific-device design or medical image-based research and development. 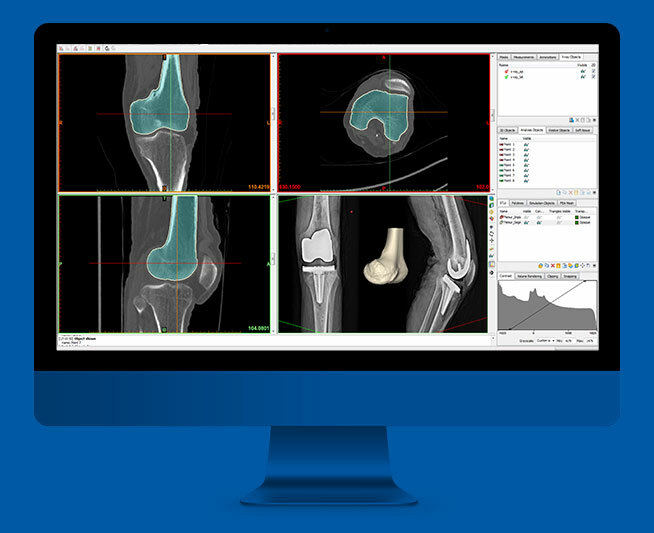 From intuitive manual tools to automated knee or heart segmentation algorithms – when you want to go from DICOM to 3D model, Mimics is your ally. Measurements of medical images and the analysis of 3D models are simplified with Materialise. You can accurately quantify and examine bones using visible information on a color map (bone thickness, pre- and post-operative bone comparison etc.). This information can then be exported for further statistical analyses. Post-operative device analysis using CT scans can be expensive and sometimes simply impossible, as patients do not necessarily want to undergo the CT radiation of an extra scan. Similarly, cadaver tests can be both time-consuming and expensive. Complex anatomical measurements, cardiac anatomy and movement characteristics, analyses of pathologies or bone thickness, comparisons with statistical models; when you are dealing with complex operations, you want to concentrate on the results, not the tool. As a researcher, you are always mindful of the fact that anatomical devices will be placed in bodies. So ideally, you should be able to design with that in mind. Our Mimics Innovation Suite enables you to carry out 3D anatomical model generation for bench testing, education, hands-on procedure training and marketing. Imagine you could not only predict the fit of a new device, but also its long-term functionality in the patient’s body. Finite Element Analysis has the potential to completely revolutionize the way patients are treated. Being able to efficiently create a high-quality patient-specific FEA mesh from medical image data in an easy way with the Mimics Innovation Suite, brings you one step closer to a real clinical application. Whether planning for patient treatment or designing a new implant, you want to make the right decision. Move forward confidently by simulating the procedure and analyzing the device fit on a patient’s actual anatomy. The Materialise Mimics Innovation Suite takes you seamlessly from scan to virtual surgery, taking away the guesswork. As device designers, the clock is always running. At the same time, designing patient-specific devices requires a total focus on quality. Materialise provides high-quality tools that are developed to ensure that you streamline the design process while meeting the quality requirements of patient-specific devices. In addition, our services mean that you can tap into the flexibility of high-level automation if needed. The expertise and experience that lies behind the development of the Mimics Innovation Suite is put to use in several other fields. Often, this is related to the power of specialized patient-specific tools. In archeology, for example, bone fragments and skeletons have been analyzed for historical research. Looking further back, some applications are used in the study of fossils. Discover the fastest way to activate your Materialise Mimics 21.0 license!